Football season is upon us, and that means one of my favorite food times of the year, TAILGATING! There's just something special about getting together with family and friends, dressing in your favorite school or team colors, firing up the grill, and having a great time! That's why I love my BBQ Chicken Sliders w/a Coca-Cola Sauce. With just a few simple ingredients you're going to have the perfect tailgating treat. And the best part is you can do the cooking the day before to save yourself some time on game day! I know you're going to love these and I can't wait to share with you my great idea for a family friendly beverage bar! Since this is a party I headed to Sam's Club. You can't beat Sam's Club when it comes to party planning. You'll find everything you need, in larger quantities, and you can't beat the prices. 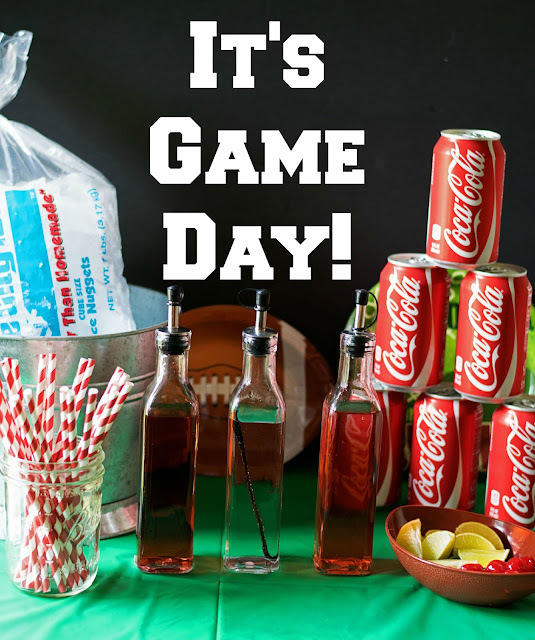 In my family there is no tailgate party without some ice cold Coca-Cola, and I love the new 28 pack that Sam's has to offer, it's perfect for my game day festivities. I grabbed what I needed and headed home to make my sliders! It would be easy to buy your favorite bottled sauce and "doctor" it up, yes. However, there is something really special about serving a homemade sauce at a BBQ. I love this Coca-Cola Sauce because with just a few simple ingredients you have a delicious sauce that tastes like you spent hours cooking it. To begin you will need to pour your ketchup into a sauce pan. I used this delicious homemade ketchup my friend Katie made me, but any store bought brand will do. Now let's add our spices. Now you can place the pot over a medium/high heat and bring to a simmer. Simmer for 30 minutes, until the sauce reduces by half. If you want a thicker sauce you can simmer this for up to an hour. After 30 minutes you will have this beautiful, silky, and flavorful Coca-Cola BBQ sauce. Each Chicken Breast will yield 6 sliders. I cut each breast in half, like an open book. Cut each side into two pieces. Then I cut the thicker end of the breast in half again. Now you are ready to grill. Preheat the grill on medium/high heat, and oil the grates with an old dish towel. Cook the chicken on each side for 2-3 minutes. After you have flipped the chicken, you can go ahead and brush with the sauce. Make sure you brush both sides and I like to let it cook for a minute or two longer to allow the sauce to caramelize. It is at this point that you can store for the next day if you want. Simply place the chicken pieces back into the pot of sauce, and all you will have to do on game day is heat the chicken through in the sauce. To assemble the sliders cut the Hawaiian sweet rolls in half. Then place a piece of chicken on the bottom of each roll. Place a piece of cheddar on each piece of chicken. I actually cut each slice into quarters. Then place a half of a slice of bacon on each slider. Place the top of the roll on each slider. And there you have it! 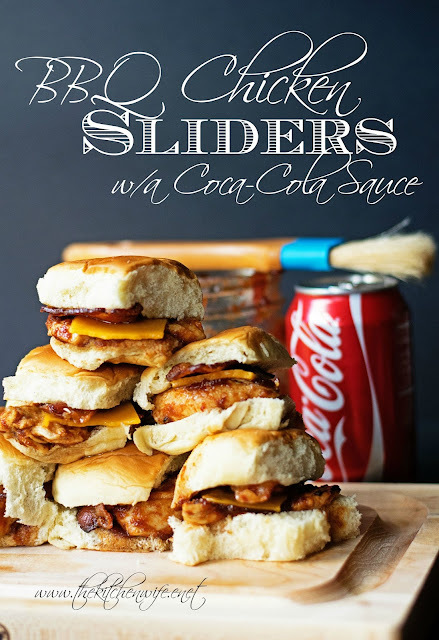 Delicious BBQ Chicken Sliders with a homemade Coca-Cola sauce. The flavor of the sauce is the perfect harmony of sweet, spicy, and smokey. And the fact that they are bite-sized make them PERFECT for tailgating! But I'm not done there! With the perfect tailgating treat, you're going to need the perfect tailgating drink. Nothing is going to go better with these sliders than ice cold Coca-Cola. And to keep things fun for everyone, I created this great Coke Bar! 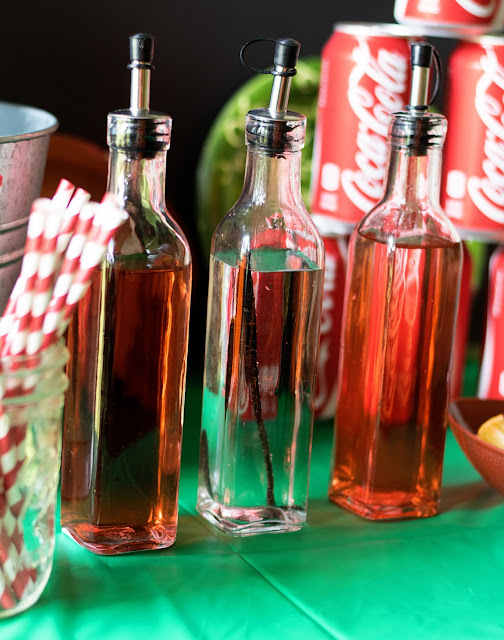 I made raspberry, cherry, and vanilla simple syrups to create all of the popular Coke flavors. Then I cut up some lime wedges and set out some Marciano cherries for people to garnish their drinks. I put out a bucket of ice in case anyone wanted to transfer the Coke "mocktail" to a cup and got these adorable straws! Can I just say that out of ALL the beverages you may have available, this will be BY FAR the most popular place to be. 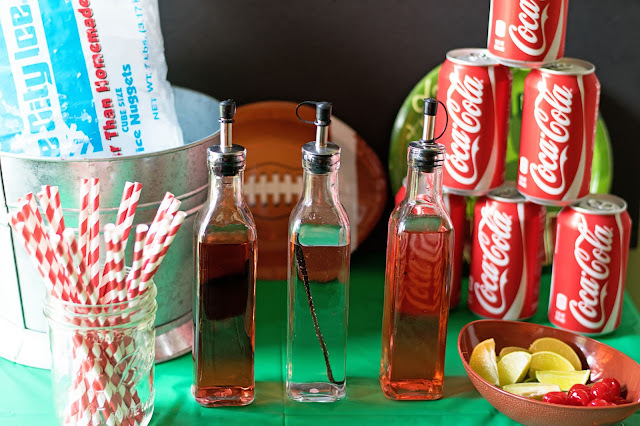 With these mouthwatering BBQ Chicken Sliders, and this super fun Coke Bar, your next tailgating event is sure to be the one everyone is talking about this football season. So head on over to Sam's Club, grab some Coca-Cola, and give this a try! Also, I would love to hear about all of the creative ways you use Coca-Cola at your sporting events! In a sauce pan combine the ketchup, Coca-Cola, Worcestershire sauce, garlic powder, onion, powder, smoked paprika, and salt. Whisk it all together until smooth. Place the sauce pan over medium/high heat and bring to a simmer. Simmer for 30 minutes to 1 hour, until the sauce reduces by half. For the chicken, cut each breast in half, like an open book. Cut each side into two pieces. Then I cut the thicker end of the breast in half again. This will yield 6 pieces. Season each piece with salt and pepper. Cook on a medium/high grill for 2-3 minutes per side until they are fully cooked and no longer pink. Baste with the sauce after you flip the chicken. Assemble sliders with cheese and bacon. *To reheat, warm in the sauce.